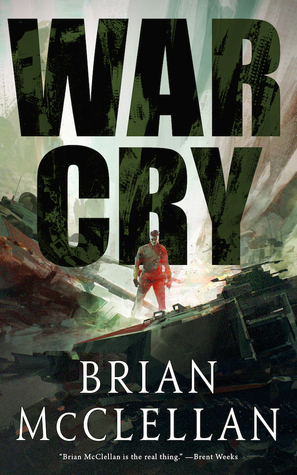 I first want to thank the publisher and the author for an Advanced Reading Copy of ‘War Cry’ in exchange for an honest review. Receiving this ARC in no way influences my overall opinion of the novella. But as the war continues, supplies and rations become scarce. The enemy, whom Teado’s platoon uses in order to resupply themselves, has moved back and there is no resupply coming in their near future. Teado and his platoon must make a last ditch effort to attack the enemy, recover their supplies, and get out alive. When they arrive, they find out that they are in for more than they bargained for. War Cry starts out a little slow, giving the reader a sense of what is going on surrounding Teado and his platoon. We are given a small glimpse into their struggle for survival and the limited avenues in which they can turn, but then the world-building begins and our characters are fleshed out as much as humanly possible within the confines of 96 pages. There are firefights, dogfights, hand-to-talon combat (see what I did there? ), political intrigue, etc, all of which McClellan excelled at in his Powder Mage novels, except the talons of course. Pre-order your copy today. Release date is August 28th, 2018. Yay, I’m a huge fan of McClellan so I have high hopes for this one. Seeing your rating has me even more excited now! I’m so glad to hear it lived up to all your expectations. Woohoo! I think you’ll love this one :). Can’t wait to see what you think!